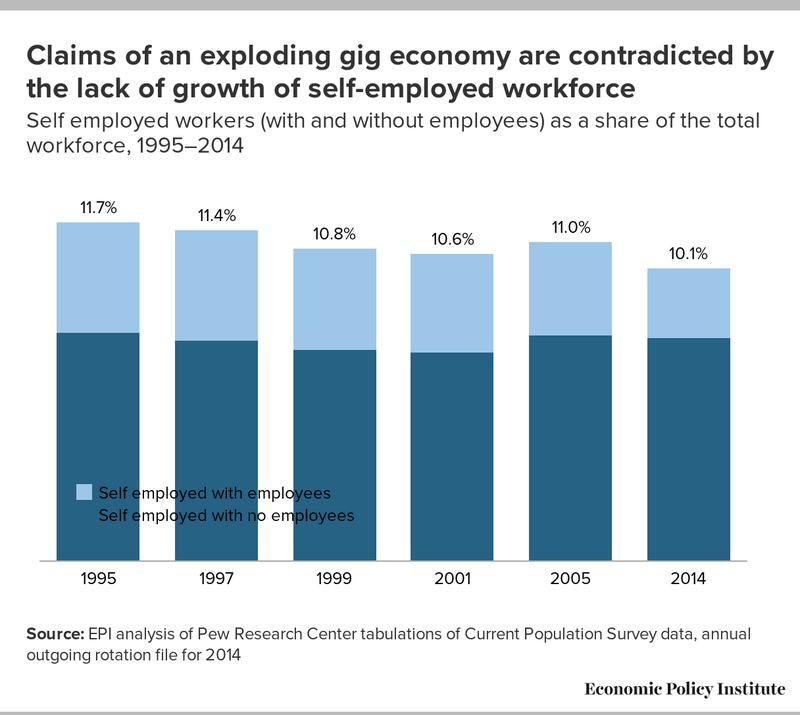 One way to track growth in the “gig,” or Uber, economy is to identify the share of workers that are self-employed. As Justin Fox has written, self-employment has actually fallen, contradicting the notion of an exploding gig economy in which everyone will soon be a freelance worker. In 2014, data from the Bureau of Labor Statistics (BLS) show that only 10.1 percent of those with jobs identified self-employment as their primary work. This is down from 11.1 percent in 2007 before the recession and from 10.7 percent in 2000 and less than in any year in the 1990s or 2000s. Some analysts claim that the BLS data do not reflect the many people working gig jobs on a part-time basis or as an extra job. Perhaps, but if this is true then the unmeasured gig workers do not consider gig work their primary job and there is no reason to believe that ‘gig’ work will soon be a dominant form of primary work activity. In fact, there are ways in which reported self-employment seriously overstates those who might be gig workers—almost a fourth of the self-employed also report that they have paid employees. In fact, a recent report from the Pew Research Center claims that the self-employed employ an additional twenty percent of all employees. An analysis of Pew’s data shows that in 2014 the self-employed may have been 10.1 percent of total employment but only 7.7 percent of total employment was self-employed persons that did not employ anyone else. Analysis of historical data going all the way back to 1995 shows that self-employed workers without paid employees maintained a relatively stable 7.2 to 7.9 percent of total employment. This provides a different picture of the scale and trend of gig employment as a primary job than looking at total self-employment: in this new view, gig jobs represent a smaller share of total employment and the share of gig employment has been stable (rather than falling) since 1995.